Dr. Phillip was also in Las Vegas in September of 2017 to attend the Dentrix Business of Dentistry Conference. He recently completed two training programs in Dallas, Texas. The first training was the Planmeca Digital Academy and focused on the use of digital scanners for partial or complete restorative procedures. The second training was in 3D imaging with the Acteon Dental Group. Outside of work, he enjoys dancing, poetry, and watching football and basketball. His passions are food, growing, cooking, and eating. He also believes he needs to give back to the less privileged in society. With a group of friends, he has formed a NGO called Blessing in Giving (BiG). They make monthly contributions into a fund to help the needy. BiG is currently putting up a primary school building for the inhabitants of the village of Abamkrom in the Central region of Ghana. For Dr. Phillip, a dentist is a Doctor, Engineer, and Artist all at the same time (DENTIST). He therefore finds it a joy to relieve, soothe, and console a person who has dental concerns. He speaks Ga, Twi Ewe, and English. 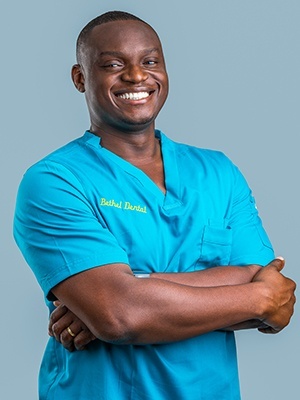 HE currently lives in Accra with his wife Gwen, who is also a dentist and currently completing her residency in Pediatric Dentistry.